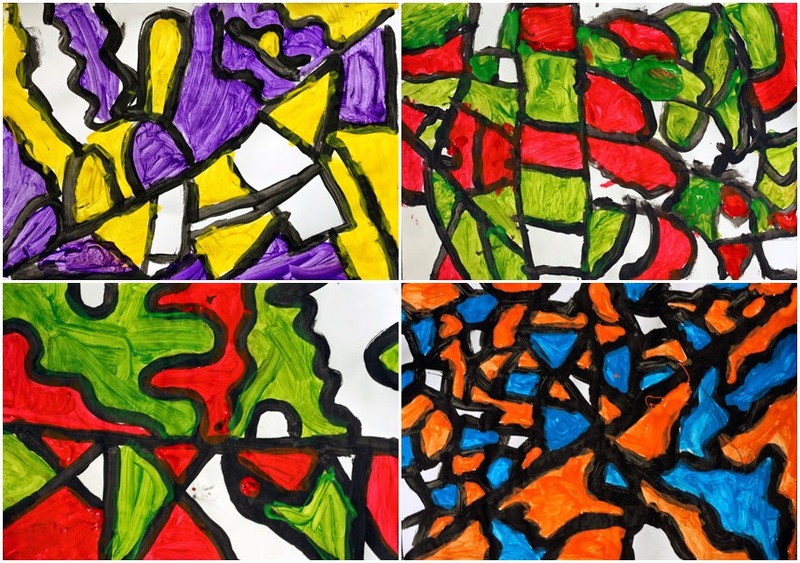 These patterns, made from complimentary colours plus black and white, were all made by Year 1 students. Step one in the process: divide the paper in half with a single painted black line. Each child chose whether to halve their paper horizontally, vertically or diagonally. Step two: paint intersecting straight lines on one half of the paper, and intersecting curved lines on the other side (as many lines as the students wanted, still in black). Step three: choose a colourway from three given combinations (blue & orange, red & green, or purple & yellow). The combinations are all complimentary colours — those which are opposite each other on the colour wheel. Students then painted some (but not all) of the resulting shapes with these two colours. As often as possible I try to plan for students to make some conscious decisions in their art making. Even though the time and resource constraints of the school setting mean that these options are not often left wide open, they still help to foster ownership and enthusiasm from the children and mean that there is more variety in the resulting art. Every child was asked to make two deliberate choices within this process (how to halve their paper, and which colour combination to use). The first image above includes all of the students' work. Below are four that you can see a little closer (click on the image to see them bigger again). I know that simple graphic patterns won't be everyone's "cup of tea" — but I love them! Great project for complementary colors! They look stunning together as a group! 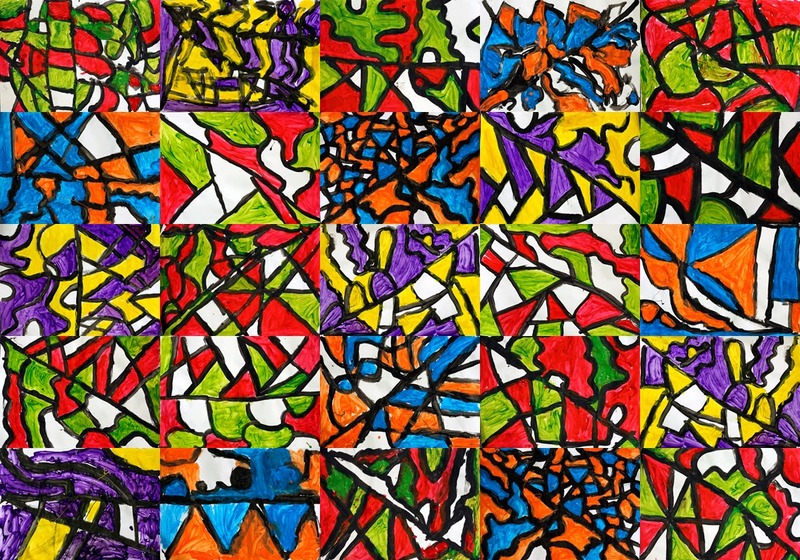 You always do such Fantastic pattern art lessons! The collective piece is so striking - frame worthy modern art! Ditto Mary. Your awesome art lessons have your signature.